AP Images (a.k.a. AP Media Archives) is a database of photographs from the Associated Press (AP). You cannot use images from AP images in online courses, presentations or any kind of publicly viewable or available materials without getting a license. To learn to access the college's research databases or enter your college login, go to How To Access Library Databases. If prompted, enter your college login and password. During your session, you may be prompted for a username and password. Click Cancel and continue. There is a search box at the top of the screen. Type your keywords or subject into the search box. Optionally, use the pull-down menu next to it to specify the time. Click the red Search button. To get to Advanced search, lick the red Advanced next to the Basic Search box. Optionally, if you want a photo of a person, put their name in the People box. If you want a photo of an event, put its name in the Event box. Finally, click the gray Search button at the bottom. Use "" (quotation marks) to combine words into phrases. Use and, or and not to combine your keywords. Use * (asterisk) at the end of a word to find all variations (e.g., exam* finds exams, examiner, examination, etc.). Click the thumbnail image to see the full-size version along with information about it. Click the name of the image to view the full-sized version with image information. 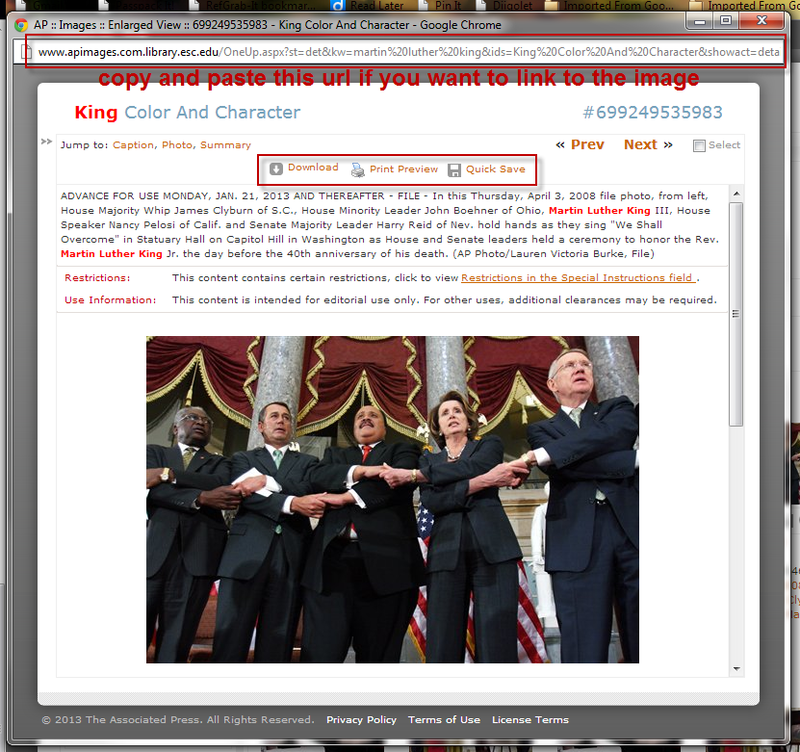 Click the checkbox underneath the image to select it. Once you have selected all the images you want on this page of search results, you can click the View Selected or Download button at the top of the search results list. The little gear/sprocket icon opens a menu that allows you to Download, Quicksave, View Slideshow, View Detail (image information) or Print. The down arrow icon allows you to download. The diskette icon allows you to quicksave. The magnifier icon allows you to view the image information. At the top of the left navigation column, you can narrow your search down by related subject. Below that, you can narrow your search down by the name of a person related to the subject. 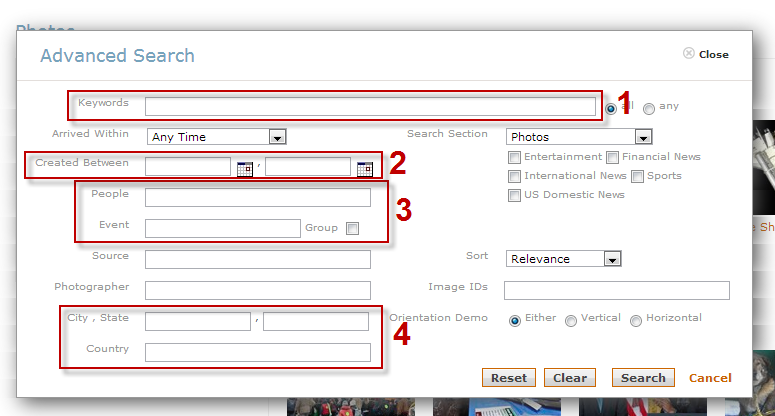 Below that, you can narrow your search down by the name of of an event related to the subject. 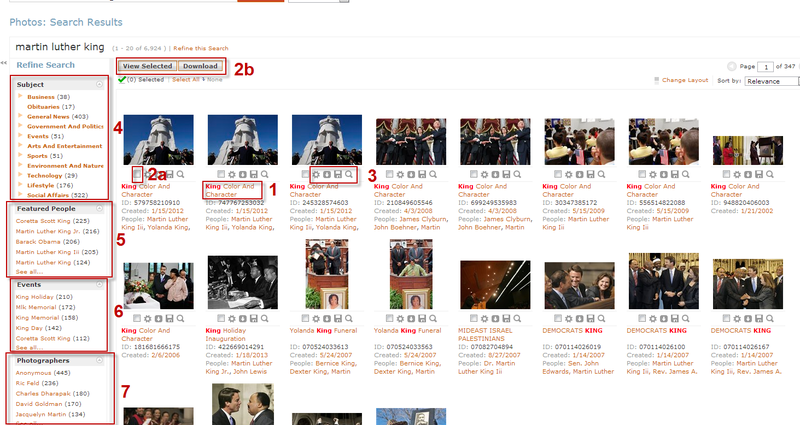 And below that, you can narrow your search down by the name of the photographer who took the image. When you click on an image, you get a full-size version of the image and several options for how to use it. When you link to an image, anyone with a college login and password can view it, but it may have a watermark. Click an image once to open the preview. Highlight the URL at the top of the preview window. Click on an image once to preview it. Click Print Preview at the top of the page. Follow the prompts to print the image.